Gustavo Bergalli was born in 1940 in Buenos Aires. At the age of twelve he began his studies on trumpet and as a teenager he started off with Louis Armstrong as his guiding star in twenties-inspired groups with names such as the Royal Garden Jazz Band and the Dixieland Smugglers. Gradually he played his way through the history of jazz, collecting enduring impressions from Roy Eldridge, Dizzy Gillespie and, above all, Clifford Brown. In his own warm and well-articulated playing one can also perceive an echo of Bix Beiderbecke, Chet Baker and Miles Davis. Later on he established himself as a leading voice of the younger generation in South America, touring and recording extensively with the most outstanding groups and soloists on that continent. Gustavo represented Argentina by participating in the most important jazz festivals there. His trumpet playing has been featured in the groups of Gato Barbieri and he has also performed with the Michel Legrand Orchestra, to name a few, as well as being a founding member of two of Latin America's most important jazz groups, Buenos Aires Jazz Quartet and Quinteplus. In 1975 Gustavo emigrated to Stockholm, Sweden. Life for a jazz musician has never been an easy one (especially when moving to a new country). Gustavo, however, established himself as one of the very top musicians on his instrument in this country, with an unshakeable reputation as a jazz musician of the highest caliber. He has a wealth of experience behind him, having, for instance, led his own quintet, played with the Swedish Radio Jazz Group and the Stockholm Jazz Orchestra, in the company of many prominent guests such as Bob Brookmeyer, Jim McNeely, Bob Mintzer, Joe Lovano, Phil Woods, Jimmy Heath, Maria Schneider and John Scofield. 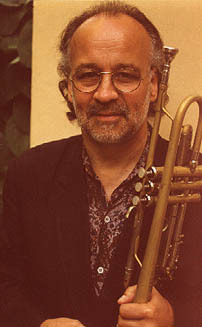 He has also made regular tours all over Europe with several groups, among them Klaus Ignatzek Quintet. Over the years he has made many recordings, including four in the role of leader, and several others as featured soloist with, among others, Paquito d'Rivera and Carlos Francetti. In 1992 Gustavo Bergalli received a scholarship from Laila and Charles Gavatin's Foundation for Jazz Music.